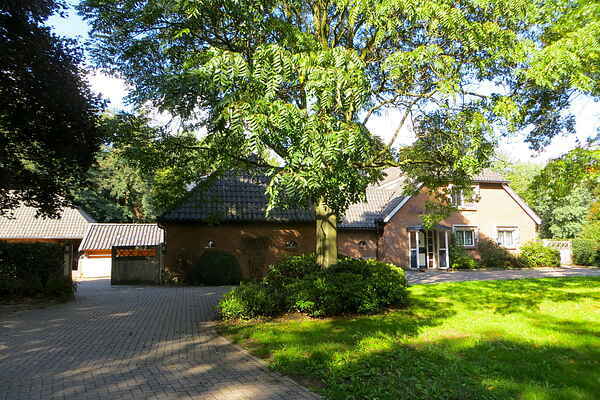 The holiday home is located in the area around the village of Wesepe, near the IJssel, the Sallandse Heuvelrug, the Holterberg and the Hanseatic cities Deventer and Zwolle. The house is suitable for 4 adults and possibly an extra child. The holiday home is attached to the villa and features two spacious double bedrooms, a luxurious bathroom and a living room with open plan kitchen. In the back and front of the house you'll find a beautiful garden, where you can relax and enjoy the natural surroundings while the children are playing. The furnishings are bright and comfortable and ensure a pleasant stay. There also is a small horse stable near the house, very nice for the children. It's also possible to bring two horses and keep them here. The holiday home is a good base to go walking and cycling in the Salland region. From the house itself, as well as from the garden/terrace, you can hardly hear any cars. The surroundings exude peace and quiet! You can cross the IJssel river with the bike ferry. The villages of Wijhe and Olst, located by the IJssel, are nice to visit. A trip to indoor playing paradise Ballorig or Adventure park Hellendoorn are a must for the children.